American-born Ida Bieler has set a standard in the course of her unusual career, as a musician of extraordinary scope. Following an unconventional course, her experience and repertoire span all facets of solo and ensemble performance, bringing her acclaim from critics and public alike for her uniquely personal and communitive interpretations. Launched into recognition by winning international competitions on three continents: Gold Medal, Public Prize and Contemporary Music Award at Rome’s International Competition „Valentino Bucchi“, the International Violin Concours Dr. Luis Sigall, Vina del Mar, Chile, the International Competition for Chamber Music „Vittorio Gui“ in Florence and New York’s Concert Artists Guild Award, she has since appeared regularly as soloist with orchestra, recitalist and chamber music player at major music capitals throughout the world. 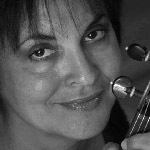 Ida Bieler has performed and been a frequent guest artist in major international festivals, such as; the Schleswig-Holstein Musik Festival, Rheingau Musik Festival, the Beethovenfest Bonn, Schwetzinger Festspiele, Schubertiade in Hohenems, the Marlboro Music Festival, Casals Festival Puerto Rico, Paris Festival Châtelet and Tivoli Festival. She has collaborated with artists such as Karl Engel, Gerhard Oppitz, Leonard Hokanson, Konrad Elser, Mischa Maisky, Boris Pergamenschikow, Gérard Caussé, Radovan Vlatkovic, Marie Louise Neunecker, Patrick Messina, as well as members of the Guarneri, Amadeus and Emerson Quartets. Ms Bieler’s artistic focus and repertoire, staggering in extent, stretches from the Baroque to contemporary composition. Her performances and recordings of complete work cycles, from Bach’s Solo Sonatas and Partitas to the complete sonatas of Bartók, Hindemith, Corigliano and Penderecki, have received acclaim usually reserved for the “specialist” in each of several styles. She has premiered works by Aribert Reimann, Volker David Kirchner ,Moritz Eggert; and with the National Symphony Orchestra of Mexico under the direction of the composer, she gave first performances of Krzysztof Penderecki’s Metamorphosen – Concerto per violino ed orchestra no. 2. Ida Bieler’s CD catalogue boasts an exceptionally wide and stylistically varied range of solo and chamber music repertoire. Awards have included the Cannes Classical Award, Echo Klassik Preis, Fono Forum Stern des Monats, Repertoire “10” and the Strad’s “Chamber Music Selection of the Month”. As a chamber musician, Ms Bieler was a member of Germany’s legendary Melos String Quartet from 1993 until the quartet’s retirement from the concert stage in 2005. She has performed and recorded with the Ensemble Villa Musica, and since 2001 has been violinist of the highly acclaimed Xyrion PianoTrio. In 2009 she founded the Robert Schumann Ensemble Düsseldorf. One of the first women to win a concertmaster position in a major European orchestra, Ida Bieler served from 1983-1988 as concertmaster of the Symphony and Opera Orchestra of Cologne, the “Gürzenich Orchester”. In 1988, she accepted a full professorship at Frankfurt’s, Hochschule für Musik und Darstellende Kunst, and in 1993 received the appointment of Full Professor, successor to Sandor Vegh leading the masterclass for solo violin and chamber music, at the Robert Schumann Hochschule Düsseldorf. From 2005-2007, Ms Bieler was Visiting Professor for violin and chamber music at the Guildhall School of Music and Drama in London, and is currently Guest Professor at the Universität für Musik und Darstellende Kunst Graz, Austria. Ida Bieler has led international masterclasses regularly at the Schleswig-Holstein Musik Festival, the Hindemith Institute Blonay/Switzerland, the Stiftung Villa Musica Rheinlandpfalz, Landesmusikakademie Schloss Ochsenhausen, Landesmusikakademie North-Rhine-Westphalia, the Oberstdorfer Musiksommer, and as well at major universities and music schools in the USA, Canada, Hongkong, Japan, New Zealand and Australia. Her new initiative, the Vivaldi Project Düsseldorf, a teachers’ training program aimed at educating underprivileged children, has been awarded Germany’s coveted “Ideen für die Bildungsrepublik” prize for 2011. Ida Bieler has served on prestigious international competition juries including; “Franz Schubert and Modern Music“ International Competition Graz, the Tromp International String Quartet Competition Eindhoven, Charles Hennen Chamber Music Concours, the Spohr Competition for Violin Weimar, the Deutscher Musikwettbewerb, Wettbewerb des Kulturkreises des BDI, the Stiftung Villa Musica Rheinland-Pfalz, Grand Prix d’Eurovision, the “Deutsche Stiftung Musikleben” Hamburg and “Kultur macht stark. Bündnisse für Bildung” – competition of the Federal Ministry of Education and Research, Germany. Working together with Germany’s Schott Verlag, she has edited new editions of works by Edward Elgar, Franz Ries, Pierre Rode, Bedrich Smetana, Josef Suk and Henri Vieuxtemps. Ms Bieler received her early musical education at the University of the North Carolina School of the Arts studying with Ruggiero Ricci and Marc Gottlieb. She continued her studies at the Juilliard School in New York, graduating as a student of Oscar Shumsky and Felix Galimir. Gaining important artistic impulses from her work with Nathan Milstein in London and Zurich, she ultimately earned the Konzertexamen degree as a student of Max Rostal at Cologne’s Hochschule für Musik, Germany. She plays a violin from Thomas Balestrieri Cremonensis, Fecit Mantuae. Anno 1753.